Newa Reviews - Is it a Scam or Legit? Using 3DEEP Technology, NEWA is an anti-aging device promising to provide pain-free benefits such as improving skin texture, reducing wrinkles, and repairing the elasticity and tightness of the facial skin. Looking to improve the appearance of your skin? The NEWA Skin Care System might be the solution you’re seeking. This anti-aging skin treatment claims to represent an advanced technique for improving skin texture, reducing wrinkles, and repairing the elasticity and tightness of the facial skin. Through the use of patented 3DEEP technology, NEWA’s skincare device is purported to stimulate the growth of collagen, which can tighten and lift the skin on your cheeks and jawline and eliminate crow’s feet. Safe for personal use, this technology relies on radio frequencies to create a pain-free, professional skincare treatment without a spa visit. According to the NEWA website, over 90 percent of users notice improvements to their wrinkles after just one month of use. Will you be among those to notice improvements with NEWA? Are there other options you should consider during your investigation? Let’s help you find some answers by starting with the device’s core functionality. NEWA’s 3DEEP technology is powered by medical radio frequencies, although the manufacturer doesn’t specify exactly what these frequencies are. Pro tip: For reference, EndyMed’s in-office Professional Model delivers a maximum power output of 65 watts and a total radio frequency energy of n/62mJ to U, along with a pulse duration of one to six seconds. Nonetheless, the device is designed specifically for women with light to medium-dark skin tones, and produces gentle heat that penetrates deep into the dermis layer where collagen—the main structural protein in skin, which is responsible for providing firmness—is naturally produced. It also comes with an activator gel to help further boost collagen production. In short, by heating skin to the optimal temperature for collagen production, the NEWA system and activator gel are designed to help boost collagen production. And because collagen is essential for providing your skin with shape and elasticity, it claims to improve the overall appearance and make you look younger. To use, gently massage the NEWA device on a small section of your face in circular motions. For best results, NEWA recommends dividing your face into six sections, with each section getting treated for four minutes at a time. The device's built-in timer automatically lets you know when it's time to add more activator gel and switch to another section. After a few weeks of practice, many users find that they can easily do their NEWA treatments in bed or while watching TV. After an initial four-week boosting phase, during which you’ll use the device five days per week, NEWA recommends that you continue treatments twice per week, as your skin will continue to improve for six months or more. It’s also possible to continue your regular skin care routine on top of using the system. What Does the NEWA App Offer? 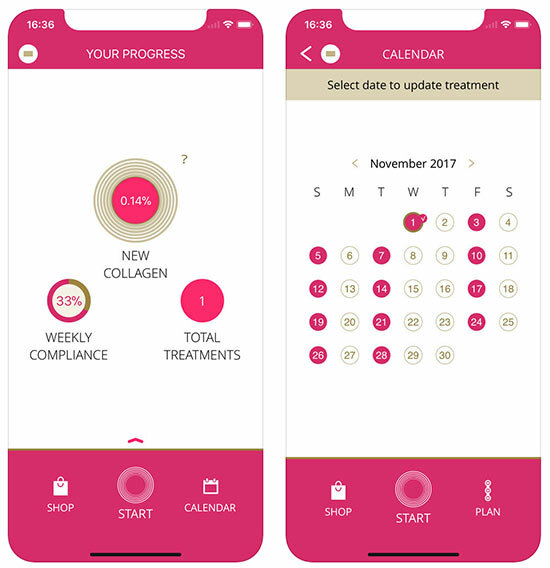 NEWA’s iOS and Android app don't add any functionality to their device, but it can help you "maximize your experience" by allowing you to track your treatment progress, create your own treatment calendar, and add treatment reminders. There, you’ll also be able to access instructions on how to use your device; tips, advice, FAQs, and videos, as well as NEWA’s online store for purchasing treatment gels and creams. App or not, all of this certainly sounds great. But, is there any clinical evidence to support these claims? Another 2016 study that paired the 3DEEP technology with microneedling. A 2015 study looking at its ability to reduce cellulite and contour different parts of the body. A 2011 study gauging its ability to address lax skin, wrinkles, and acne scars. A 2010 study involving 23 participants, also looking at lax skin and wrinkles. As a wellness company, EndyMed manufactures a whole line of in-office medical devices (including the Pro model mentioned earlier), and their patented 3DEEP Technology is used and recommended by thousands of dermatologists around the world, including Dr. Neil S. Sadick from the Department of Dermatology at Cornell University, who is quoted showing his support on the NEWA website. Could NEWA Cause Potential Side Effects? They also point out that while using the NEWA device, your skin may will feel hot in places, and if it begins to feel uncomfortable, the company recommends making bigger circles. Overtreatment should also be avoided, meaning that four minutes is long enough for each section. With this said, considering the high frequencies used in professional settings, proper application technique is crucial in achieving beneficial results. Again, without knowing if NEWA utilizes these same frequencies, there’s no way to recognize if this same precaution also holds true for the in-home device. How Much Does the NEWA System Cost? The NEWA® Skin Care System is currently priced at $449.50 on their website, either as a single payment or across five monthly installments of $89.90. Regardless of the ordering option you choose, it will also come with free shipping, a 60-day supply of activator gels, an instructional DVD, and a two-month refund policy. To request one, NEWA’s customer support department can be reached at 1-800-314-7508. What Are NEWA Customers Saying In Their Reviews? On Amazon, the NEWA skincare system had six customer reviews and an average rating of 4.1 stars. There, most compliments appeared to reference effective results and ease of use, while the few complaints related to high price and lack of results. From a company perspective, EndyMed (formerly Applisonix Ltd.) is based out of NYC and has been in business since 2003. They held a B rating with the Better Business Bureau, based on two closed customer complaints, as of 1/24/18. The only complaint with details referenced difficulty obtaining a refund, although the matter seems to have since been resolved. 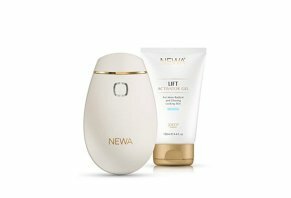 Are There Other At-Home Radio Frequency Skin Tightening Devices Like NEWA? How to decide which of these options, if any, will best meet your needs? Any time you’re focused on changing an underlying aspect of your skin, it’s important to start by having an honest, in-depth discussion with a doctor about your concerns, as well as what you’re looking to achieve. From there, they can recommend options that will deliver the most value for the money, based on your specific diagnosis. It’s also important to point out that we encountered limited clinical evidence supporting the efficacy of at-home radio frequency devices during our research (although NEWA, specifically, has quite a bit), so your doctor can also help set realistic expectations regarding the results you might achieve. Finally, just like any other consumer purchase, you’ll want to focus on doing business with companies who come with mostly positive online feedback and support their products with at least 30-day refund policies, with realistic S&H charges and no restocking fees. According to Jason Emer, MD, a Los Angeles0based dermatologic surgeon, when it comes to in-office treatments, “Not all RF devices are the same, and the results are technician dependent—that is most important.” However, based on the general lack of conclusive clinical evidence we encountered, it seems unclear if this is necessarily the case with lower-powered at-home versions like NEWA. But if you feel like rolling the dice on the device, EndyMed supports it with a 60-day refund policy, which, if used daily as recommended, should be more than enough time to decide if it meets your expectations. Bottom line: For those that are committed to reducing the appearance of fine lines on their face without seeking treatment from a dermatologist, the NEWA Skin Care System seems like it could be a viable home treatment option (we didn’t test the device ourselves). Whether or not you find the price tag worth the end results is up to you and your dermatologist. Do not order directly through the Newa website. This company is a scam in the returns process. They guarantee a full refund of your charge within 30 days if you are not satisfied/item is defective. I returned within 15 days using their return label. To date, they have never refund the money. I've called three times. They put you on hold forever, then they say they are talking with their supervisor who says he will refund your card. It never happens! Unless you directly dispute the charge with your credit card, you will never get your refund money back from this company. It is a scam for vulnerable customers. I will be complaining to the Federal Trade Commission. When I heard it was backed by the FDA, I decided I had to have it. Now, I am not certain that it doesn't work entirely. However, I have been involved in anti-aging products for most of my life and have found that no pain, no gain. Of course, nothing to leave a person raw, burnt or bloody, but this is basically warm with a light and the gel may work better with a different gadget on the market. The price for a light piece of plastic is out the window insane. Luckily, eBay now has a few. Do not order this product, it is a scam! Not only does it not work, when you send it back for a refund they won't give it to you. They will keep "claiming" they sent it to corporate and they need to approve it to refund you. I have spoken with customer service at Newa at least six times and they keep giving me the runaround. I sent my product back over five months ago and still NO REFUND! They are a SCAM! After four weeks, the device started to smoke. It cannot withstand a lot of use. I mailed it back. They are very slow to respond when refunding your money. I have had to dispute the charge with my credit card company to get my money back. When you call customer service on the website, you are directed to a third party firm. Evidently, NEWA is very slow to respond to the third party firm. I was also told that a few people have had to dispute their charge in order to get their money back. This is a SCAM! Don't waste your money! Write a Review for Newa!